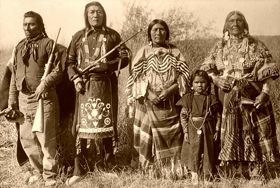 The Bannock Indians are a Shoshonean tribe who long lived in the Great Basin in what is now southeastern Oregon and Southern Idaho. Calling themselves the Panati, they speak the Northern Paiute Language and are closely related to the Northern Paiute people, so much so, that some anthropologists consider the Bannock to be simply one of the northern-most bands of the Northern Paiute. Early on, the Bannock subsisted primarily on fish and small game. They fished with harpoons, hand nets, and weirs built from woven willows. They also provided for their survival by gathering and using a number of plant foods. Primarily, they lived in teepees and small conical lodges made of sagebrush, grass, and woven willow branches. Later, they developed a horse culture and associated closely with the Northern Shoshone, and were a widely roving tribe. Although Shoshonean in language, they were generally described in early reports to more closely resemble the Nez Perce. Lewis and Clark, who passed through the country in 1805, may have included the Bannock under the general term Shoshone, or, more likely, these are the Broken Moccasin Indians they mentioned. The first specific encounter was reported by Jim Bridger in 1829, who estimated they had about 1,200 lodges, indicating a population of about 8,000. 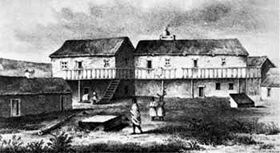 In 1833, explorer, Benjamin Louis Eulalie de Bonneville found them on the Portneuf River, immediately north of the present Fort Hall reservation. The northern division of the Bannock tribe were encountered by Washington Territory Governor Isaac Stevens in 1853, who found them living on Salmon River in east Idaho. In all probability, these Salmon River Bannock had recently crossed the mountains from the east, escaping pressure from the Siksika Indians, since they claimed as their territory, southwest Montana, including the rich areas where Virginia City, Bozeman, and other towns would later be established. Stevens stated that they had been more than decimated by the ravages of smallpox and battles with the Siksika. The Fort Hall Reservation was set apart for them in 1869 and 600 Bannock, in addition to a large number of Shoshone, consented to remain on it. However, most of them soon wandered away. 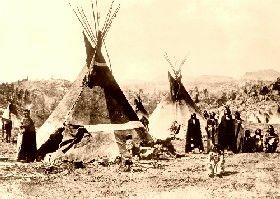 By 1878, with the loss of their traditional hunting lands, dramatic reduction in the number of buffalo, and the failure of the government to provide assistance, the Bannock, led by Chief Buffalo Horn and joined by the Northern Paiute Indians, began to raid white settlements in search of food. This soon led to what is known as the Bannock War when the U.S. Cavalry, under General Oliver Otis Howard, was sent in to crush the Bannock. The cavalry won two battles against the Indians in southern Idaho before killing some some 140 Bannock men, women and children at Charles’ Ford, Wyoming. Afterwards, the remaining Indians gave up and returned to the reservation. By 1885, the Bannock at Fort Hall were said to number 422 and by 1901, 513. However, by this time, they were so intermixed with the Shoshone, that no attempt was made to count them separately. Between the original treaty of 1868 and 1932, the reservation set aside for the Bannock and Shoshone was reduced more than two-thirds, from 1.8 million acres to 544,000 acres, due to white settlers encroaching upon the land. Today, many of the Bannock still live on the Fort Hall Indian Reservation in southeastern Idaho, along with the Lemhi and Northern Shoshone Indians. The tribal government offices and most tribal business enterprises are located eight miles north of Pocatello, Idaho in Fort Hall. The reservation, nestled between the cites of Pocatello, American Falls and Blackfoot, is divided into five districts: Fort Hall, Lincoln Creek, Ross Fork, Gibson and Bannock Creek. More than 70 percent of the tribes’ approximately 5,300 enrolled tribal members still reside on the reservation and 96% of the land still remains in tribal and individual Indian ownership. The reservation employs nearly 1,000 Native and non-Native people in various trades, including nearly 600 in tribal government, as well as more in individual enterprises and more gaming. Its tribal government is focused on building the tribes’ economy and ensuring the protection and enhancement of the reservation land base for future generations. The ruins of the fort are located on the reservation. The community of Fort Hall, along Interstate 15, is the largest population center on the reservation.